The Bishop McManus Academy Hall of Fame began with its Inaugural Induction Ceremony in May 2013. Owen McManus, Jr. and Jonathan Sorapuru became the Hall’s first inductees and were honored to be a part. 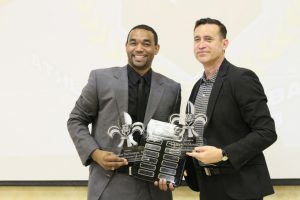 These two outstanding men have made, and continue to make outstanding contributions to the high schools and colleges of Louisiana through their extraordinary efforts as athletes, administrators, coaches, and Pastors. Because of their hard work, commitment, and desire to excel in achievement and or performance, their superiority stands out as shining examples for others to emulate. Each year the Bishop McManus Academy Hall of Fame accepts nominations of deserving coaches, athletes, and athletic contributors for possible selection and induction. Only the BMA Hall of Fame Committee members, and previously inducted Hall of Fame members may nominate individuals. Here are some guidelines to follow to have someone nominated and considered for the Bishop McManus Academy Hall of Fame. A person who has experienced outstanding achievement as a student-athlete in a sport or multiple sports while enrolled at Bishop McManus Academy for a minimum of two years. An athlete is eligible for membership a minimum of five years after competition ends.